We do our best to provide you with all kinds of great resources to prepare for your trip. These include packing lists, reading lists, detailed itineraries and more. All of our multiday river camping trips include tents, sleeping bags, and pads. In most cases we will even help you book a hotel room prior to and after your trip. The reservation packet that we send you will include a detailed gear list of what you should bring. To make it even easier you can buy most of the clothes at the ROWwear store. If you are planning a special event during the trip such as a birthday or anniversary, please let us know as always have a few surprises up our sleeves. On our trip application form you can indicate any food need you might have and we’re happy to accommodate those. If you transfer from one trip to another, there is a $75 per person charge for USA-based trips (within the same season) up until 60 days prior to departure and a $100 per person charge for international trips up until 90 days prior to departure. Transfers made after these times are treated as cancellations. Transfer fees for some trips such as yachting trips are more stringent. 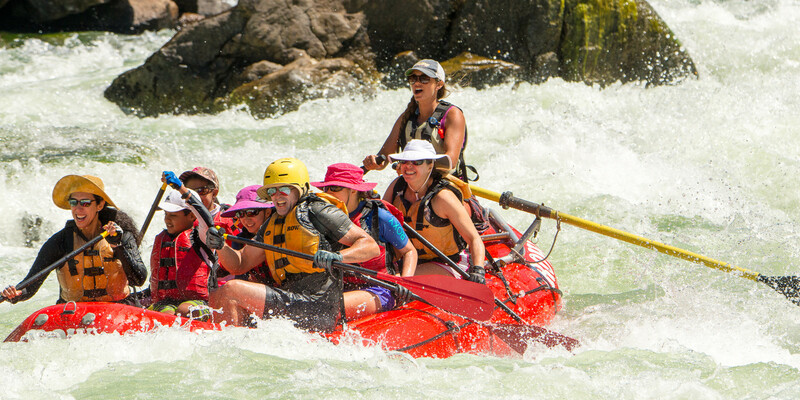 ROW Adventures reserves the right, either prior to or after departure, in its good-faith discretion and in circumstances that warrant it, to change or re-price any tour, trip, or expedition. This includes the possibility of moving to a different river or river segment due to extreme water conditions, forest fires, road closures and/or acts of God. If we are not able to provide a substitute trip, river, or altered itinerary and have to cancel the departure completely, you will be refunded in full. Refunds are limited to the amount actually paid to ROW Adventures. For non-USA-based trips, ROW Adventures must normally make substantial payments to its suppliers (hotels, transportation companies, etc.) far in advance of the trip departure date. If ROW Adventures cancels any tour, trip or expedition due to acts of insurrection, force majeure, strikes, popular demonstrations, acts of God, earthquake, flooding, or any cause beyond its control, ROW Adventures will refund the portion of the trip cost not already advanced to suppliers and use its best efforts to recover and refund the balance as promptly as possible. In the event of trip cancellation, ROW Adventures is not responsible for additional expenses incurred by trip members, such as penalties incurred through the purchase of non-refundable airline tickets, medical expenses and passport and visa fees. ROW Inc. operates under special use permits granted by the Bureau of Land Management: Jarbidge, Vale, Cottonwood, Coeur d’Alene and Judith Resource Areas. We operate under a special use permit granted by the U.S. National Forest Service on the: Salmon, Payette, Boise, Challis, Clearwater, Umatilla and Panhandle National Forests. Also the Hells Canyon National Recreation Area, Wallowa-Whitman National Forest. ROW Inc. is bonded and fully licensed by the states of Idaho, Washington, Montana and Oregon. We are members of: America Outdoors; Idaho Outfitters and Guides Association; Montana Outfitters and Guides Association; National Association of Interpretation; Lewis and Clark Heritage Trail Foundation and many other effective organizations. ROW Inc. operates all our trips in the United States of America and ROW Sea Kayak Adventures, Inc. operates our trips in British Columbia, Canada. All other trips in foreign countries are arranged through our sister companies Remote Odysseys Worldwide, Inc. or ROW Sea Kayak Adventures, Inc. and are operated by independent suppliers that provide the goods and services for your trip including, for example, food service providers, equipment suppliers, yacht and other transportation companies, lodging facilities, local ground operators, certain guides, etc. As a result, neither ROW Inc., Remote Odysseys Worldwide, Inc. nor ROW Sea Kayak Adventures, Inc. their employees, shareholders, subsidiaries, affiliates, officers, directors and successors, (collectively ROW Adventures) are liable for any expense, irregularity, bodily injury or death to person, damage to property, negligent or willful act or failure to act of any such company or individual providing these services, or of any other third party. Our trips are budgeted for full or near full sign-ups which enables us to offer trips at the lowest possible price. Because of numerous fixed costs, it is more expensive to operate a trip for a small group. Therefore, on some of our trips, in order to avoid having to cancel a trip, we have a “tier-pricing” system to avoid canceling a trip with a low number of sign ups. We have found that most people also prefer this alternative to having a trip cancelled. Thus, you will not on our trip prices there is a different price for 6-8 people versus 9-10, versus 11-12. Tier pricing is calculated on the number of full revenue passengers. Trip physicians, staff or guests of ROW (travel writers, trip leaders-in-training, office staff, etc.) are not included in the tier pricing structure. Trip costs quoted are based on foreign exchange rates current at the time of this printing. We reserve the right to raise the trip fee if there are exceptional cost increases beyond our control. We will initially invoice you at eh higher tier price, and refund the difference depending on the final group size. You may book air transportation for this trip through one of the airlines online booking sites, by working with a local travel agent, or contacting ROW’s preferred provide – Exito Travel at 800-655-4053 or online at wwww.exitotravel.com. This is an independent company that has wholesale agreements with several airlines and can often get very good fares. If you do book online or buy discount tickets through a consolidator, the tickets can be restrictive and you should review the booking conditions carefully. These tickets tend to have stiff penalties for changes or cancellations. Once you have booked your flights, please fax or mail us a copy of your air itinerary so we can inform your trip leader of your expected arrival.